Abraham Pieterse Vosburgh and Geertruy Pieterse Coeymans are the 9th great-grandparents of Richard, James, Gary, Lisa, Carl, Jane, Bruce, Cathy, Ron, Stacey, Matt and Sandy; and 10th great-grandparents of Asher, Owen, Caitlyn, Becky, Emily, Jack, Jill, Jordan, Mike and Brian. Abraham Pieterse Vosburgh was born in Brabant, Holland, in 1620, the son of Pieter Jacobse Vosburgh. His mother’s name is unknown. Abraham was trained as a carpenter and emigrated to New Netherland in 1649 and settled in Rensselaerswyck. Initially, he was engaged to perform renovations on the Patroon’s house. In April 1651 he leased a house and lot north of the Patroon’s house for 16 florins a year. That same year Abraham married Geertruy Pieterse Kuijemans (AKA Coeymans), born c1632 in Utrecht and a 1639 emigrant to New Netherland with her parents, Pieter and Jannetje Kuijemans and six siblings (one of whom, Barent, went on to become the first settler of present-day Coeymans, New York, a suburb of Albany). Abraham and Geertruy had five known children: Maretje (our ancestor; born 1656), Peter, Jacob, Isaac and Abraham. In the “Oath to the Patroon taken by all the householders and free men of the Colonie, November 23, 1651,” is found the name Abraham Pietersz Vosburg. On April 15, 1652, Abraham and another man, Derrick Janssen, were appointed surveyors of buildings: they were sworn in two days later. On March 17, 1654, a warrant was issued to the treasurer, “in favor of Abraham Pietersen Vosburgh, carpenter,” for the amount of 200 florins for building two bridges. On May 19, 1654, he was fined for not finishing the bridge over the Second Kil. That he experienced difficulty in completing his contract is shown in the Court Minutes, for on May 30, 1654, he stated that work on the bridge over the Third Kil would be begun in eight days. Further difficulties in the completion of the work took place in June, and he was compelled to employ Andries De Vos as his attorney to protect his interests. On September 2, 1654, a warrant was issued to the treasurer, “in favor of Abraham Pietersen Vosburgh for his work on the two bridges in Beverwyck.” But this evidently did not settle the matter, because as late as May 1, 1655, the Court granted him a delay in paying his fines for not completing the work on time. On September 30, 1656, Hans Jansz and Abraham Pietersz Vosburch obtained a lease of the water power on the creek south of the farm of Jan Barentsz Wemp. The lease commenced January 1, 1657, and ran for six successive years; rent was set at 100 guilders or 100 good merchantable boards and two pair of fowl each year. A condition of the lease was that the lessees were not to sell liquor to the Indians. A sawmill was erected on the creek, which was in later years known as Wynant’s Kil. Hans Jansz was more or less of a silent partner in this enterprise; at least his name never appears again in the records in connection with it. After hostilities by the local Esopus Indians, the Dutch colonial Director-General Pieter Stuyvesant visited Rensselaerswyck in June 1658. The following is from Stuyvesant’s journal: “Four carpenters came also on the 18th engaged by Mrs. de Hulter to remove her house, barns and sheds (within the stockade) and on the 19th three more, whom I had asked and engaged at Fort Orange to make a bridge over the Kil. They were also to help the others remove their buildings, for which they had asked me before my departure for Fort Orange.” Abraham Pieterse Vosburgh was one of the carpenters engaged by Stuyvesant. The outlying settlers withdrew within the stockade for better protection, and no further encounters with the Indians took place until a fateful day in September 1659. A man named Thomas Chambers engaged eight Esopus Indians to break off corn-ears for him while he was gathering his crops for the winter. 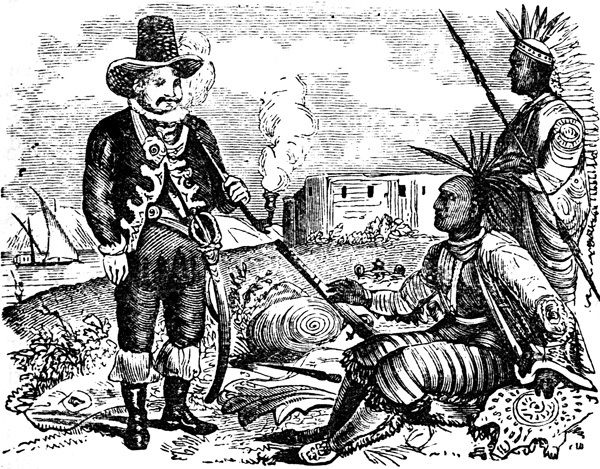 On a Saturday evening, after the day’s work, Chambers gave the Indians a quantity of brandy. After drinking the brandy the Indians became noisy and quarrelsome; when the brandy was exhausted, they tried to obtain more from Chambers, who refused. After a time soldiers were sent out from the fort to ascertain the cause of the disturbance. The nervous soldiers fired upon the drunk and disorderly Indians, killing one. The following morning, Sunday, The next day the Indians returned with hundreds of reinforcements, and destroyed crops, killed livestock, and burned buildings. A dispatch was sent up the river by boat to Albany to summon assistance. As the dispatch party returned, they were captured by the Indians. Among the thirteen men captured was “a carpenter, Abraham by name.” In a letter from Vice-Director La Montagne to Director-General Stuyvesant, dated September 26, 1659, he states that the capture took place “at the Esopus last Sunday the 21st inst. about two o’clock the afternoon,” and in the list of those captured the name Abraham Vosburgh appears. The next day, one captive was exchanged for an Indian prisoner, while another escaped during the night, leaving ten in captivity. A letter to Director Stuyvesant from Ensign Smidt of the Dutch garrison at Esopus, dated November 1, 1659, states that as a result of the good efforts of two “Mahikander” Indians, two prisoners were returned to the Fort “on the first of this month.” In a subsequent letter from Ensign Smidt to Vice-Director La Montagne, dated November 13, 1659, he writes: “it is true we have got back two prisoners, but they keep [one] yet and have killed all the others.” The surviving captive, Evert Pels, was still in captivity as late as February 24, 1660. According to contemporary accounts, Pels’ life was saved by an Indian maiden whom he afterwards married. With the death of Abraham, Geertruy Pieterse carried on raising her children, all of whom were under ten, alone. Her story can be pieced together from the Fort Orange Court records. Her name appears before the Court many times, both as plaintiff and defendant. Geertruy was zealous in preserving her rights; she was clearly a fighter and possessed of sharp wits. Geertruy did not remarry within a year or two as was usually the custom with the early settlers, but remained a widow for nearly ten years and fought her battles unaided. Her second marriage, with Albert Andriessen Bratt in 1669, was short-lived (perhaps 18 months) and ended in divorce. After her divorce, Geertruy continued to use the name Vosburgh; in fact, from the evidence in the records, it is probable that she never used the name Bratt at any time. Geertruj sold the mill in 1674. The final years of Geertruy Vosburgh’s life were spent in Kinderhook, New York, surrounded by the families of her sons, all of whom became prominent citizens in that community. Geertruy died in February 1689. The sole daughter of Abraham and Geertruy, our ancestor Maretje, married Isaac Janse Van Alstyne in the Dutch Reformed Church in Albany on October 20, 1689.